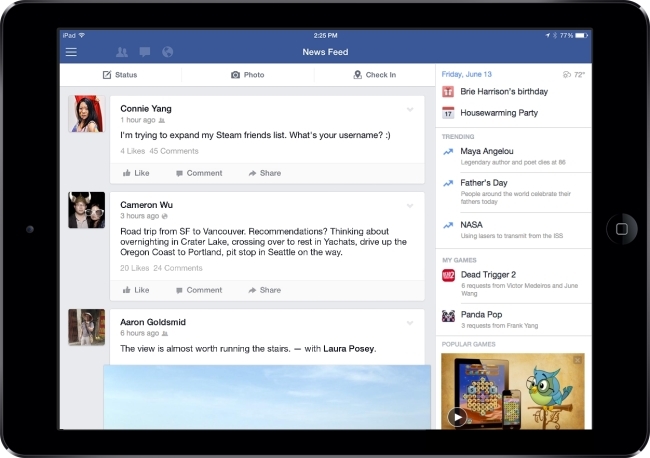 Facebook announced an update for its iPad application, in which a new column was added on the right-hand side of News Feed, which includes birthdays, events, and four new sections aimed at promoting engagement with trending topics, videos, and games. Trending topics: A feature launched on desktop in January, Trending is a list of topics people are talking about most on Facebook right now, personalized to include topics you’re interested in, as well as topics trending across Facebook overall. Trending videos: A feature new to iPad, trending videos includes a personalized selection of the most-shared videos among your demographic on Facebook right now. My games: A selection of games you already play, with an easy link to start playing them on your iPad. Popular games: iPad games you might want to play, based on games your friends have played and what’s popular on Facebook. In the latest update to Facebook for iPad in the U.S., we’re testing new ways to help people discover more timely and entertaining content on tablet. This update will surface content on the right-hand side of the iPad that’s relevant to how people use tablets today, which is primarily to read news, watch videos, and play games. More than 70 percent of people who use Facebook for iPad worldwide played a Facebook-connected game in the past 90 days. So we’re also dedicating a section of the iPad app to games people play, and over time, we will include ads where game developers can engage players. Register their iPad app with Facebook (in App Dashboard). Integrate Facebook Login, if they don’t have a canvas app. Upload a video to the app details page in App Center (details here). 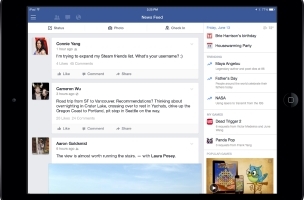 iPad users: What do you think of the changes to Facebook’s app?